Come join us on Monday, May 29th for the 2017 Hunger Walk. This year we will continue to take a stand against hunger in our community. On Memorial Day, we will be participating in the Hunger Walk and 5K Run to benefit the Freestore Foodbank's network of partner agencies (LIFE Food Pantry). 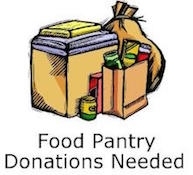 You can join our team, or start your own team that can also support the LIFE Food Pantry.